Today, Statistics Canada is updating the chapters on internal migration and on fertility in the Report on the Demographic Situation in Canada. The first chapter analyzes internal migration trends in Canada in 2015/2016 (July 1 to June 30), based on the most recent final estimates from Statistics Canada's Demographic Estimates Program. The second chapter presents the most recent fertility trends in Canada from 2012 to 2016. It provides a detailed analysis of the evolution of the total fertility rate (number of children per woman), including provincial and territorial variations, average age at childbirth including by birth order, completed fertility rates, the annual and daily numbers of births, biological childlessness, and multiple births. In 2015/2016, there were 277,029 interprovincial migrants in Canada, or 7.7 migrants per thousand, down slightly from 2014/2015 (283,809 or 8.0 per thousand). Interprovincial migration in 2015/2016 was notably lower than the largest observed total of 437,549 interprovincial migrants in 1973/1974. While having no impact on the overall Canadian population size, interprovincial migration has an important influence on how the population evolves and changes in the provinces and territories. Since 1971/1972, the beginning of the period covered by the current population accounting system, interprovincial migration has tended to flow from the central and eastern provinces to the western provinces, and between the western provinces. However, this trend changed in 2015/2016. In 2015/2016, Alberta (-15,108 or -3.6 per thousand) and Quebec (-11,118 or -1.3 per thousand) had the largest interprovincial migratory losses in absolute terms. 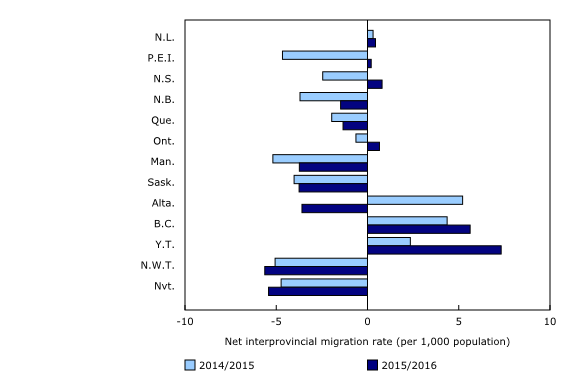 Over the same period, Saskatchewan and Manitoba (both at -3.7 per thousand) had the lowest interprovincial migratory rates among the provinces. This was Alberta's first negative net interprovincial migration since 2009/2010 (-3,271), the year following the 2008/2009 economic downturn, and its lowest net interprovincial migration since 1987/1988 (-23,223). The recent negative net migration coincided with lower oil prices that affected Alberta's labour market beginning at the end of 2014 and sustained into 2016. Nonetheless, preliminary estimates for the third and fourth quarters of 2017 indicated recent trends may have tempered in Alberta, with the province recording moderate gains in net interprovincial migration (+1,045) from July to December 2017. The largest migratory flows between provinces in 2015/2016 were from Alberta to British Columbia (29,304) and from Alberta to Ontario (19,421). Coincidentally, British Columbia (+26,573 or +5.6 per thousand) and Ontario (+9,077 or +0.7 per thousand) were the primary recipients of net interprovincial migration in 2015/2016, as were three of the four Atlantic provinces, with New Brunswick as the lone exception. This was the first period since 2009/2010 where more than one Atlantic province added persons to its provincial population through interprovincial migration. This variation in the migration of persons from the Prairie provinces to Central and Eastern Canada could be partly due to the aforementionned economic circumstances. Over the last 16 years, there has been an average of 997 births per day in Canada. 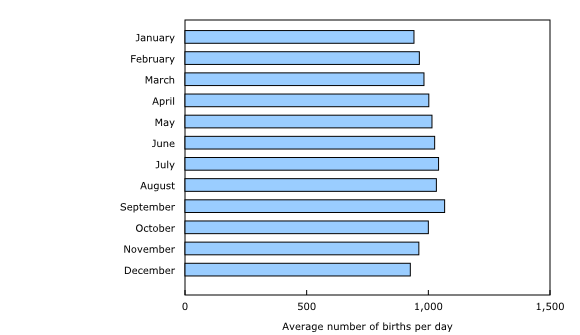 The highest daily average was recorded in September (1,067 births per day), followed by July (1,042 births per day). Conversely, the lowest average per day was recorded in December (926 births per day) and January (941 births per day). The ratio of summer/winter births in Canada was 1.11 in 2016, meaning that the number of births in the summer was 11% higher than in the winter. This ratio averaged 1.11 from 2001 to 2016, fluctuating between 1.06 in 2001 and 1.13 in 2007. On average, from 2001 to 2016, the day with the highest number of births was September 24 (1,110 births per day), followed by September 16 (1,107 births per day) and September 20 (1,105 births per day). These three dates occur about 38 to 39 weeks after Christmas, and 37 to 38 weeks after New Year's Day. In contrast, the day with the least number of births was December 25 (673 births per day), followed by December 26 (702 births per day), December 24 (804 births per day) and January 1 (816 births per day). Those dates are national holidays—New Year's Day (January 1) and Christmas (December 25)—or the day before or after. Planned deliveries may occur outside public holidays as hospitals have more resources during regular work days. From 2001 to 2016, there have been more births during the week (particularly from Tuesday to Friday) than on weekends (Saturday and Sunday). On average, there were 1,088 births per day from Tuesday to Friday and 975 births on Mondays. In comparison, there were, on average, 858 births per day on Saturdays and 792 births on Sundays. Since some births are scheduled in advance, such as planned Caesarean sections or births induced for medical reasons, these births are more likely to occur between Monday and Friday, as hospitals have more resources during the week. According to the General Social Survey on Family, the proportion of women aged 50 or older who have never given birth to a child was 15.3% in 2011, compared with 14.1% in 1990. Those women may still have had families through other means, such as adoption, blended families or surrogacy. The intention of never having children differs according to various characteristics. For example, the proportion of Canadians aged 20 to 39 in 2011 who did not intend to have children was higher among single people than those who were married or in a common-law relationship. As well, people in their 20s and 30s with no religious affiliation were more likely to report not planning on having children than those with a religious affiliation. Although the number of births in Canada fell from 1991 to 2016, the numbers indicate that births of twins or more rose during the same period, from 8,138 to 11,992 multiple births. In all, 3.1% of all births in 2016 were multiple births, compared with 2.0% in 1991. Births of twins or more were up in all age groups of mothers, with greater increases as women advanced in reproductive age. A certain number of factors can contribute to this increase in multiple births among women aged 30 or older, such as increased use of fertility treatments and postponing motherhood to a later age (increased chance of producing more than one ovum at a time). This release summarizes two more detailed articles that analyze recent trends in internal migration in Canada, at the provincial and territorial and the census division levels, as well as births and fertility in Canada, at the national, provincial and territorial levels. Interprovincial migration represents all movement from one province or territory to another involving a change in the usual place of residence. The average number of births per day for each month takes into account the different number of days per month as well as leap years. Biological childlessness among women is defined as never having given birth to a child. Biological childlessness is considered only in women aged 50 or older, as the likelihood of giving birth after age 49 is very low. Blended family refers to a couple who lives with at least one child born before the current union. Surrogacy is an arrangement in which a woman carries and gives birth to a child for another person or a couple. Multiple births refer primarily to the births of twins and, in rarer cases, triplets, quadruplets or more. A more detailed analysis can be found in the articles Internal migration in Canada for 2015/2016 and Fertility: Overview, 2012 to 2016, available in the publication Report on the demographic situation in Canada (Catalogue number91-209-X). For more information, or to enquire about the concepts, methods or data quality of this release, contact us (toll-free 1-800-263-1136; infostats@statcan.gc.ca) or Media Relations (613-951-4636; mediahotline@statcan.gc.ca).